Since I returned to Nigeria, I seem to be bumping into people I know from the past everywhere I go. It is a delight to cross the initial hurdles, “You look familiar. Which school did you attend? Where do you or did you work?” and finally make the connection. Somewhere in between catching up and exchanging telephone numbers, they inevitably say something like, “You have not changed a bit; you look just the same!” That remark makes me wonder if they are blind or trying to be kind. Now, I admit that I am colour-blind to the shades of grey that should be painted on the canvas of friendly conversation. Trying to be truthful, but frantically digging into my shallow well of diplomatic graces, I guardedly reply, “Well your face has not really changed either,” forcing my wandering eyes to focus on the face and not the torso that shows telltale signs of a lingering love affair with food. It is a thrill to hear what they have been up to or what they are currently involved in. I listen in child-like awe as they highlight past achievements, summarize current assignments, and state their aspirations with convincing conviction. If I bump into two or more male acquaintances, I am amused because their antics remind me of a book title I’d seen years ago, My Mercedes is Bigger than Yours. Nevertheless, I marvel at just how well people are getting on with their lives. My bubble burst when I recounted my various run-ins to friends who were not impressed. “Effizzy, it’s all effizzy,” they replied. Responding to my blank stare, they informed me that effizzy encompasses a wide range of attitudes, mannerisms, and lifestyles that make one appear to be The Jones that others are keeping up with. I disagreed and commented that people have carved niches for themselves in consulting and others have resigned from well-paying jobs to become entrepreneurs. “Ha!” they scoffed. “I consult for several schools, is effizzy for I take my portfolio round schools and try to convince them to buy my goods.” “I resigned from my job to start my company and we are into telecommunications, oil prospecting, you name it, is effizzy for I almost got fired so I quickly resigned. My office is in my living room and I am trying to swindle any unsuspecting!” I wondered if they were not being too cynical, after all, what is wrong with working hard to score a good impression? I did not give our effizzy discussion any more thought until recently. I had gone to the salon to have my hair done and a smartly dressed young man introduced himself as the resident trichologist and chief stylist. He reeled off other credentials that I cannot remember and wanted to fix my hair. I declined preferring instead to have my usual stylist. He commented on my eyebrows, which I had carefully tweezed that morning and thought looked great. He insisted that a beautiful woman like me needed to complete my look by having nicely arched brows. He wondered quite loudly if I had ever had them professionally done. I began to feel small and unsophisticated in this posh salon before this proficient beauty expert. Inwardly praying that he would stop the verbal harassment, which portrayed me as unglamorous, my voice dwindled to a whisper as I maintained that I was happy with my looks. A few moments later, a client walked in. Mr. Trichologist wowed her with his resume and he proceeded to fix her hair. I was startled from my silent introspection over the arch of my brows by a scream from across the room. The new client was upset with Mr. Trichologist because he had damaged her hair and weave. Mr. Trichologist remained unapologetic while insisting that he knew what he was doing. As I gazed at her over-processed, nearly burnt tresses, two words floated from my subconscious: articulate incompetent, oh I mean, effizzy! I always wonder why people feel the need to reel off recent accomplishments when they reunite with old acquaintances. Must you strive to impress? But I think we also feed that urge by sometimes being too curious about (and too impressed with) about people’s lives. Lately, I’m learning to walk that fine line between being genuinely concerned and feeding that voyeuristic tendency to probe when I shouldn’t. Let each one just live their life jare…. We are a showy people, but you’re right, we needn’t be. Thanks Ella for being here. I will check out your blog. “now, I admit that I am colour blind to the shades of grey that should be painted on the canvas of a friendly conversation” – You have talent as a writer – that is a great sentence – it says so much in a few short words and says it beautifully. its the kind of writing that needs to be read aloud so the words fall off the tongue – keep it up. well like I said – keep at it cos its a delight to read. Hmmm nice one. Frankly I believe effizy is veery Typical? we generally like to flash that new accomplishment or recently acquired knowledge, skill, car, ring, business– 🙂 what have you? No matter how freshly acquired or green it is! I suppose the gratification of seeing Faces of astonishment, wowed expressions; hearing the ‘uhs’ and the ‘wows’ is enough reward. Is effizy really the reason for the peripheral results we see glaring us in the face as we pass through our badly repaired roads, dilapidated universities, half baked schools and grossly shallow polity? 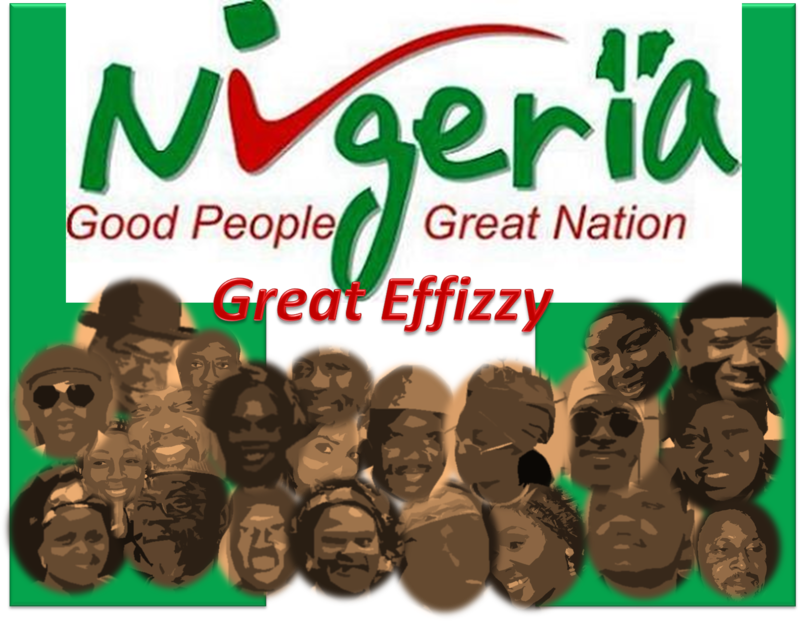 Is effizy really a lot more deep seated in the fabrics of our society than we dare to believe or think? Indeed like The Master said it is the seed that falls on good soil and has its roots firmly mingled in the soil that produces fruit—–a hundred, sixty, thirty!! I started reading with a big smile knowing as usual I was going to be thoroughly entertained and then suddenly, Eureka! The realisation that my experiences with Nigerian hairdressers was all “efizzy” brought another big smile to my face. I love to encourage and patronise small Nigerian businesses in London with one exception, hairdressers! Unfortunately from experience they will use “efizzy” to rope you in, damage your hair, destroy your weave and then use “efizzy” to justify it and if that doesn’t suffice will resort to insults. lol Afi, a narrow escape indeed… all na effizzy! Looolzzzz. Timi you see what I mean. Which sane woman will shop for foodstuff at shoprite, lol. Effizzy, may God deliver them. lol Nnenna… rich people shop there! Meet a guy wherever I need an assistance. The guys are real. You know what I mean, lol. Nnenna I feel you. When I returned to Nigeria, I was asking ladies which market was better for buying foodstuff, meat, etc. Everyone told me they shopped at Shoprite! lol! But to prove stereotypes wrong, it was a lady who finally directed me to a market! Nnenna, lol! Yes, I think we can agree that effizzy doesn’t have a gender! Why did you think it applied to ladies alone? Well… if you don’t have anything else working for you, you could always resort to “Effizy”. Lol!